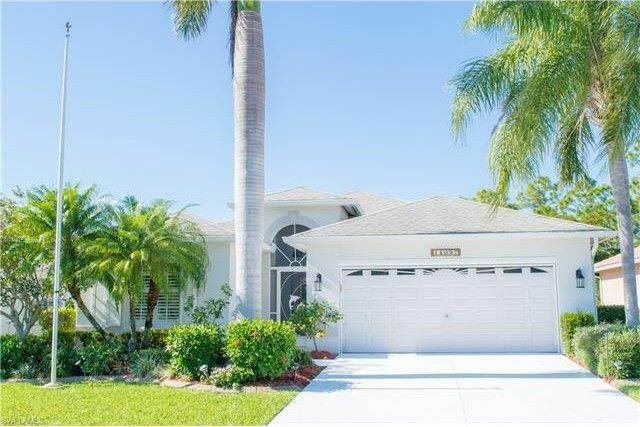 Classic Florida ranch home in premium 55+ gated community of Heritage Cove. This 2 Bed, 2 bath home with den is super clean and well kept and is located on a premium culdesac lot. This home offers newer carpet and hardwood floors installed in the past year, newer dishwasher and microwave, newer A/C (2017) and water heater (2016) as well as whole home water filtration system. The home has full hurricane shutter protection. The spacious lanai accessed from the breakfast room has a view of the wooded preserve behind the home. The home is furnished for a quick move-in, ready for season. Live the active Heritage Cove lifestyle with a beautiful clubhouse, pool and hot tub. Activities abound for sports (tennis, bocce, shuffleboard) and social events. Heritage Cove is located in South Ft. Myers near shopping, restaurants and the beaches. Full time onsite property management. See it today! Directions: From Cypress Lake and McGregor, go one traffic light on McGregor towards to beach to A & W Bulb, turn left and left again into Heritage Cove. Enter code, go through gate turn left and turn at the third street on left, Dunkirk..to Grosse Pointe turn left.